Eyewitness testimony has been the bedrock of our justice system. Studies have repeatedly shown, though, how unreliable our recollections can be. False memories can be slipped into our memory by third parties. Or we see what we expected to see and our mind fills in missing detail and that becomes our memory. We tend to re-tell a story according to the listener. Defense attorneys know this. With retelling, we become more certain that an erroneous recollection is true. Researchers at Stanford University had volunteers review suicide notes and decide which were real and which were made up. They were informed of their scores; some were told they were correct in almost every instance, others that they were wrong on most of their choices. Except all the scores were fictitious and had no relation to the subjects’ actual performance. Even after being informed their scores were bogus, subjects originally given high scores still persisted in believing they were exceptionally perceptive, much better than average in determining what was true. Right-wingers have been frothing about the nefarious deal Hillary “Lock her up!” Clinton made, selling U.S. uranium to Russia in exchange for large contributions to the Clinton Foundation. Fox News has been relentless in promoting the story, feeding the outrage against Mrs. Clinton. But then Fox talking head Shepard Smith went on the air and, point by point, took apart the story. He dispassionately pointed out that Clinton was not Secretary of State when the sale occurred, that the State Department was only one of nine Federal agencies involved, that the company, Uranium One, was mostly Canadian owned, that none of the uranium in question would leave the United States. Et cetera. Fox’s audience was not interested in facts. They turned their outrage against Shep Smith. Shepard Smith should stay with Fox News. Viewers need to be confronted with documented information, even if only rarely. 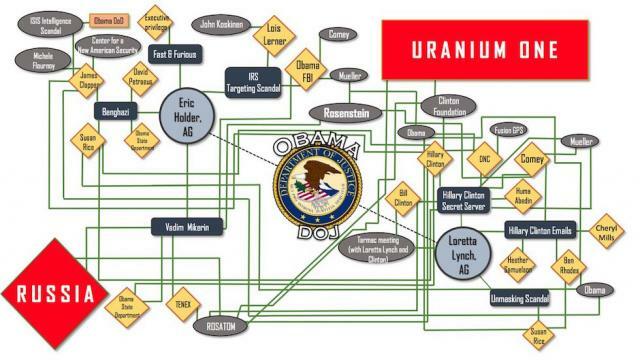 Of course, it’s hard to refute Texas Rep. Louie Gohmert’s chart showing Uranium One conspiracy. a year. 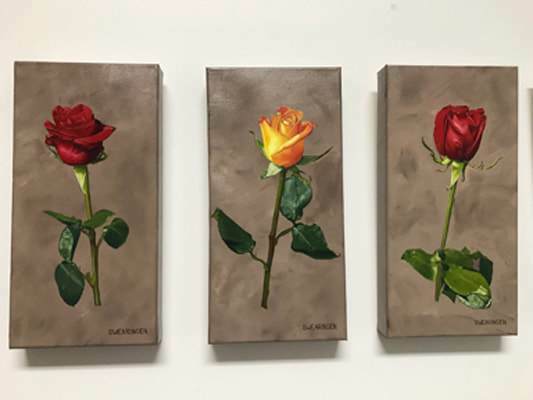 For $95, a patron of the arts could commission a rose and specify the flower and background colors. All $95 goes to the North Bay Fire Relief Fund. Village Art Supply has donated canvases for the project. 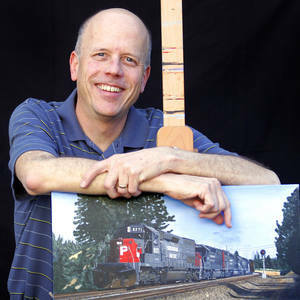 He quickly received orders for all 365 paintings, raising $34,540. 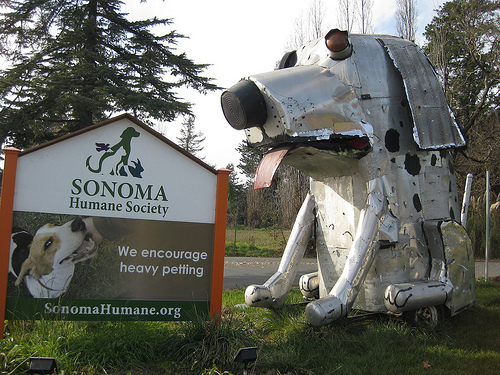 whimsical sculptures have delighted passers-by on Florence Avenue. Amiot’s work can also be seen in public places around the area. One of their major works, a full-sized carousel, to honor immigrants, was unveiled last year on Canada Day in Markham, Ontario. The husband-and-wife team decided to create a monument honoring first responders to the recent fires. Built with fire extinguishers, fuel canisters, woodstove parts and other detritus, the twelve-foot-high firefighter stands adjacent to the SMART commuter light rail in downtown Santa Rosa. Sequence 01.mov from Eric McIntyre on Vimeo. The Environmental Protection Agency announced last week that it had removed household hazardous waste from 5,500 properties in Napa and Sonoma counties, three-quarters of those destroyed or damaged by fire. Sonoma County has begun process of adjusting tax assessments. The Assessor’s office was not damaged, but was closed for several days because of mandatory evacuation. Fortunately, aerial views simplify assessing properties that have been reduced to ash. Others, in rural areas or suffering partial losses, require on-site inspections and will take longer. The fires occurred the same time tax bills were being prepared. Tax revenue will obviously be lower; the real hit may come next year. The city of Santa Rosa estimates it has lost a third of its tax base. The California Insurance Commissioner estimated insured losses will exceed $3 billion. Rebuilding costs will be high. Property owners will need to decide to rebuild exactly as what was lost, with required code upgrades, or to make changes. Shortages of contractors, construction labor and basic building materials will drive up costs. Renters, in what was already an extremely tight market, face uncertainty about what their landlords will do. Many will leave the area to find employment and housing, likely to not return. Who is coming to Santa Rosa? Lawyers, swarms of lawyers, from all around the country. 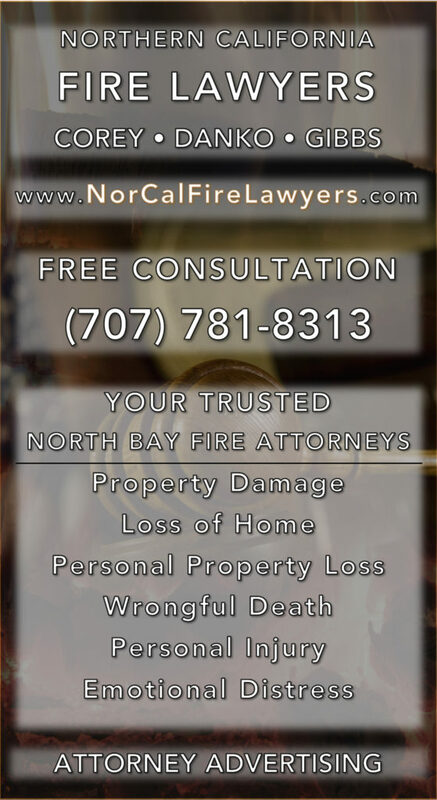 Although the cause of the fire has yet to be determined, law firms, eager to sue Pacific Gas & Electric, are invading Santa Rosa. As a former resident of Santa Rosa once said to journalists sleuthing the Watergate story, “Follow the money.” The giant utility PG&E has deep pockets and of course, is widely disliked. Sparks from power lines downed by high winds are one possible cause of the fires. The attorneys aren’t waiting; they’re advertising on billboards and TV, and setting up town-hall style meeting for prospective clients. And if PG&E lawsuits don’t work out, there’ll be plenty of other generally loathed, big-money targets to sue: insurance companies. My daughter Maureen has completed her 17th marathon, this one in New York. Here is her report. One week ago I completed the New York City Marathon. As you know, I decided to raise money for Team Fox for Parkinson’s Research, in honor of my father. I was amazed and overwhelmed by your generosity – together we raised $3,375! I want to thank you again for contributing, it means so much to me. For those who are interested, I wanted to let you know how it went on November 5th. The NYC marathon is the largest marathon in the world; this year, 50,766 participants finished the marathon. The course starts on Staten Island and makes its way through all five boroughs, to finish 26.2 miles later in Central Park. Security is very, very tight – even more so after a man drove a rented pick up truck onto a crowded bike path in lower Manhattan on October 31, killing eight people and injuring eleven more. To get to the starting line, runners must take a bus or ferry provided by the marathon organizers. I caught my bus at 6:30 am and it took nearly two hours to get to the start village on Staten Island. I passed through a metal detector with my clear plastic bag holding my supplies – you are only allowed to take bags provided by the marathon organizers. There were police and National Guards everywhere, some holding big rifles. I was in the third wave, so I spent the next couple of hours waiting for my 10:40 am start time. It was an overcast day, not windy, moderate temperature. We started on the Verrazano Narrows Bridge and immediately crossed to Brooklyn. My plan for the run was to keep to a steady, easy pace, with hydration breaks every two miles. I know all about the pitfalls of getting caught up in the moment and starting out too fast, and I did a good job of pacing myself across the bridge. As we crossed the bridge, the only spectators were police and city employees, there for security, but they still cheered the runners as we passed; one police officer was blasting “Eye of the Tiger” from his squad car, the first of three times I would hear that song. When we reached Brooklyn, we started seeing people lining the course, cheering, waving, holding signs, playing music, and giving high fives. This was my first glimpse of what I had heard so much about – the incredible atmosphere of the NYC Marathon, where nearly the whole city comes out to cheer and celebrate. We continued through Brooklyn into Queens, and I was doing well sticking to my plan. Because of security rules, I could not wear my hydration backpack and instead had to use a belt with a water bottle; I had my electrolyte drink in my bottle, and took water from the stations on the course, which meant I had quick walk breaks every couple of miles – I’m not coordinated enough to drink from a cup or bottle while running. But these little breaks were probably good for me. To get to Manhattan, we crossed the Queensboro Bridge, on the lower deck. The bridge is about a mile long, with a long, steady incline for much of the way across. There are also lots of metal seams in the bridge, and you really have to watch your step; by now, it had been misting for quite a while and everything was wet. I saw a woman ahead of me slip and fall on the ramp coming off the bridge; she jumped right back up and continued running, so I hope she was all right. I knew my sister, brother-in-law, and my husband were going to try to see me at the Queensboro Bridge, and I was right on schedule, but the crowds were so huge, I could not see them. Nor did they see me – unlike other marathons, I was always running in a pack, it never really thinned out. From there we turned up First Avenue and the crowds were tremendous. The Queensboro Bridge had taken a lot out of me, and while I felt as though I had recovered, by mile 18, things started to hurt – not that I was injured, but that my legs just started to hurt, perhaps due to lactic acid build up. By the time we reached the Willis Avenue Bridge to cross into the Bronx, I was having to take more frequent walk breaks, and my goal of finishing under 4:30 was starting to look out of reach. We were only in the Bronx for a couple of miles before crossing the Madison Avenue Bridge back into Manhattan, making our way to Fifth Avenue, and heading towards Central Park. 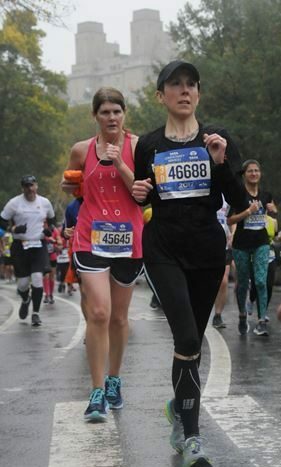 Even though I was now hurting pretty badly, I was still able to enjoy running through Harlem, where a woman on the sidelines, seeing I was struggling, stepped off the curb to blow her whistle and yell encouragement to me; those moments give me a lift that I can’t describe. By now, probably at least five hours after the first wave of elite/professional runners started the marathon, the crowds were still out there, cheering us on, all the way through Central Park, and across the finish line. My official time was 4:44:37 (30,414th place!). Because of security, I could not meet my family at the finish line; but they got to see me cross the line, thanks to my father getting tickets for the finish-line grandstand. Knowing that my family is waiting for me helps me to push through. I can’t say enough about how much it meant to me to have them there. And, thankfully, I eventually found them – I had to walk another half a mile to exit the park – and we all went out to celebrate. And I have to give so much credit to the City of New York. To put on such a huge event, to keep everyone safe, to have it run so smoothly – and to do it all with such good cheer, is an amazing accomplishment. Every New Yorker we encountered seemed so proud of the marathon, so supportive, so happy to have us there. I have never experienced anything like it. Thanks again to everyone who supported me on this journey. Please visit my personal page. Garden of Eden… in Kansas! The Garden of Eden is situated a bit above Interstate 70, 235 miles east of Kansas City, about 150 miles northwest of Wichita. If this surprises you, possibly you’re thinking of a different Garden of Eden, maybe the one that was temporary home to Adam and Eve. being carved limestone. Finished two years later, in 1907, Dinsmoor began offering tours and for the next twenty-two years added 150 sculptures representing his views on religion and politics. The artist created mammoth insects, angels with massive wingspans, forty-foot -tall trees and frolicking children. 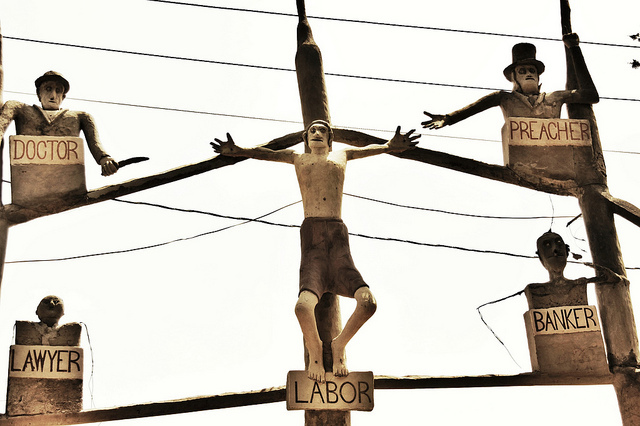 Numerous political messages included a waving concrete U.S. flag and a crucifixion of Labor by Doctor, Lawyer, Preacher and Banker. Life-sized statues of Adam and Eve greeted visitors at the main gate, Eve offering visitors an apple. 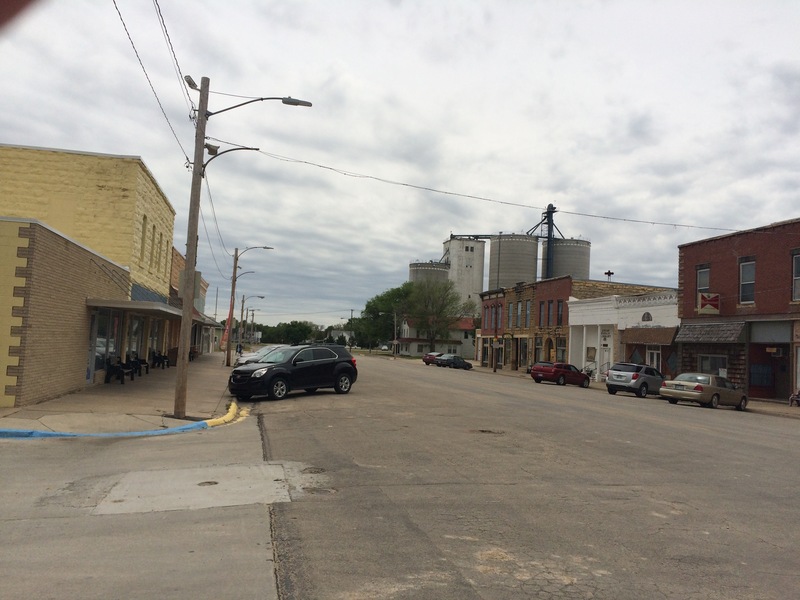 Town leaders forced Dinsmoor to cover them with concrete loincloths. An “all-seeing-eye-of-God” was hung from a branch on the “tree of life.” The “eye” included a hose that ran from the basement of the house so that Dinsmoor could shout at passersby, pretending to be God speaking to them. Dinsmoor also built a forty-foot tall mausoleum for himself and Frances. 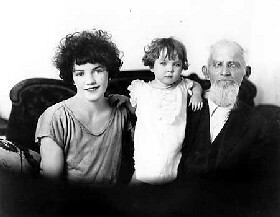 When his wife died, eighty-year-old S.P. married the family’s twenty-year-old housekeeper whom he had impregnated. They had two more children. He died at age eighty-nine and is interred in an open casket on top of his first wife. His widow sold the property to pay taxes. The property was abandoned until 1969 when a new owner reopened it. In 2012, recognizing its artistic value, the Kohler Foundation financed its restoration, including removal of clothing from statues, returning them to their natural state as Dinsmoor had intended. TripAdvisor rates Dinsmoor’s Garden of Eden at four-and-a-half out of five. Posted byGeorge Rothert November 8, 2017 November 2, 2017 Posted inPersons, PlacesTags: Garden of Eden, Kansas, S.P. DinsmoorLeave a comment on Garden of Eden… in Kansas!